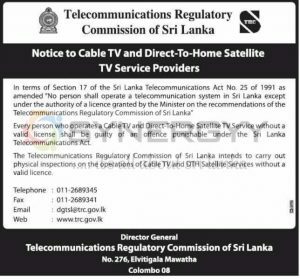 Telecommunications Regulatory Commission of Sri Lanka made a Notice to Cable TV and Direct-To-Home Satellite TV Service Providers. Every person who operates a Cable TV and Direct-To-Home Satellite TV Service without a valid license shall be guilty of an offence punishable under the Sri Lanka Telecommunications Act. The Telecommunications Regulatory Commission of Sri Lanka intends to carry out physical inspections on the operations of Cable TV and DTH Satellite Services without a valid licence.